Liam's first dinner of bananas mixed with avocados. 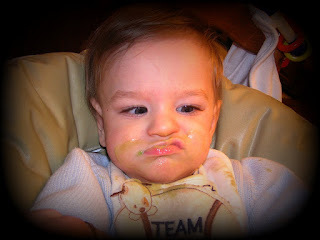 He loved the blend of the two but didn't care for the chunks- that's what this look is all about. He did pretty well with it though and ate the entire mix, chunks and all! 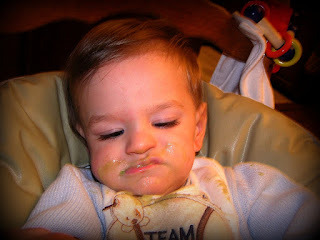 Liam's vomiting has been a daily occurrence for months and months, since around 5 mo. corrected. It has gotten so bad lately that the vomiting was numerous times a day. I never thought I would see the day that Liam outgrew his vomiting. I know that they outgrow it...my oldest daughter had the lovely projectile version and she eventually outgrew it. But I just couldn't envision a day without vomit. There are not enough ways in which to voice my shock, delight, pure joy and excitement over the fact that Liam has been vomit free since last Friday!!! I truly can not get over the fact that I have had 4 full days of no vomit! WOW! I couldn't remember what it felt like to not have to change his clothes several times a day. The erythromycin has been a WONDER drug for us! I can't get over how easy it was to break the cycle! All Liam needed was a little help with his motility and that was what was causing the vomits. He is not only keeping everything he takes in down, he is able to take a bit more at each sitting. And he is no longer refluxing! Our OT saw Liam on Monday and she said it was the first time she had every done a session with him and she couldn't feel him refluxing! Crazy, huh? Liam had a fabulous weekend. I think he feels so much better to be regular and to not feel so full all the time! You try eating a thanksgiving meal 3 times a day and see how it would make you feel. That's how Liam felt everyday. All of that food just sat in his tummy. I feel so bad knowing now that it was such a simple fix for him and wish we had done it a long time ago when I had told the Dr that I thought he had delayed emptying. Liam is doing so well on it that I don't even have to give him the whole dose that was recommended. He should get 3 doses of 1cc per day but I only have to give 2! This weekend Liam did wonderful sitting at his bench (with support) and working very hard to get his head up and stable. I can see him getting stronger week by week. His OT hadn't seen him in 2 weeks and she couldn't believe how much he had changed. His trunk control was better as well and I think it has a lot to do with the fact that Liam loves to play airplane. We started playing it a couple of times a day and since Liam thinks it's funny, I get to work my legs while he works his back! Progress for the both of us!